Who used to watch the show The Twilight Zone? Well if you did, did you know today is Twilight Zone Day? I’m not talking about this Twilight Zone! If you aren’t familiar with The Twilight Zone, click here for a quick history lesson. On a weekly basis, I dish out some dorkiness to my boys via Twilight Zone quotes such as “oh what a wondrous land of imagination” or “and now we are entering the twilight zone.” My pre-schooler always asks what that means in which I reply, it is a dimension of mind and imagination….or something usually silly yet serious along those lines. This is the Twilight Zone I’m talking about! Have a Twilight Zone party with friends or a significant other: Throw yourself into the fifth dimension by dressing up like one of the TV characters and having a Twilight Zone TV series marathon watch. Unfortunately, I can’t do this with my kids because they are still too young to watch this show. However, I will be in the crazy unknown still to be explored dimension of the TwinZone which is a reality series which I am currently producing and playing in for the rest of my life…another dimension beyond the mind of most singletons and/or parents of singletons…a journey into the wondrous but crazy land of multiples. Next stop, the TwinZone. I loved The Twilight Zone. One of my most memorable memories is staying up late with my dad to watch the Twilight Zone on the weekends. Naturally, I played off The Twilight Zone to create my TwinZone Tuesdays. TwinZone is the word I created to describe my never ceasing intangible state of Twin Shock and raising twins. So stay tuned for my next TwinZone Tuesday post, tomorrow, and if you are in the TwinZone we would love to connect and hear from you! 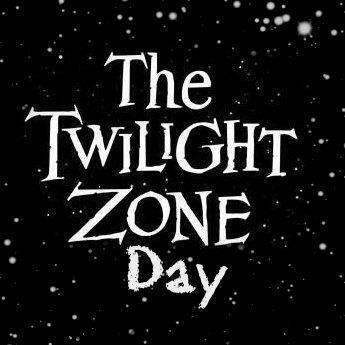 And if you are a Twilight Zone fan, or even just a Twilight fan, I’d love to hear from you…Did you celebrate Twilight Zone Day?